Hello, and welcome to The ThINKin' Spot. Here's another little teaser before the big blog hop for Peachy Keen Stamps tomorrow. Don't forget... 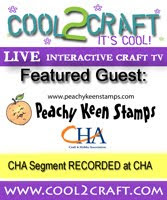 Tomorrow morning at 10 a.m. central time, the blog hop will kick off at the Peachy Keen Stamps blog. See you then! This is so great! I cant wait.